Question: I’m a catch-and-release fisherman, but I fish mostly smaller waters for small fish. That means there are few big fish and few long fights, which makes the process pretty easy. This summer I’m headed out West for the first time and I want to make I sure I do everything right if I catch a hog. What are the important things to remember when you’re releasing big fish that may be very tired? The experts agree: land them fast, use a net, and don’t keep a fish out of the water longer than necessary, especially in warm weather. Tim Pask photo. Answer: There are two important things you can do before it’s time to release a fish: 1. land it as quickly as possible, and 2. leave it in the water as much as possible during the unhooking and photography stages. To achieve #1, use the largest tippet you can get away with, and use your rod to tire the fish quickly. I hate to hear an angler say, “I landed a five-pound trout on a three-weight and 6X tippet.” He thinks he’s showing off his angling skills, but what I hear is a story about how he probably killed a big fish. As for #2, if a fish has already been stressed to the limit, the last thing it needs is for you to hold it out of the water while your buddy fumbles with the camera. Cradle the fish in the water, pointed upstream, while the cameraman gets everything ready. Then lift the fish out of the water just long enough to get the shot, and return it. 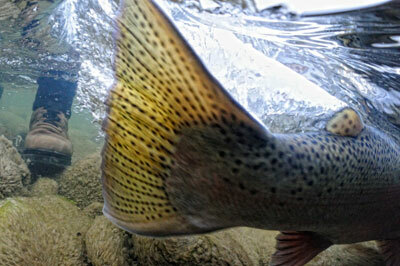 I believe the most important aspect of catching and releasing trout is to do it quickly. During the fighting process, a trout, like any athlete under physical stress, builds up a lot of lactic acid. The longer you fight the fish, the more the lactic acid builds up in its system. Once a fish reaches “acidosis,” or a point where the lactic acid buildup is non-reversible, it is only a matter of time before it dies. Many anglers release fish thinking that they will survive when, in fact, the fish will die a few hours later due to issues created during the fight and release. So, I recommend landing fish when they’re still “green,” full of fight. Remember, trout already know how to swim. You don’t need to teach ’em! Once landed, I will hold the trout facing upstream into mild current, out of muddy areas where silt could clog their gills, and I hold them until they’re wiggling enough that I cannot hold onto them any longer. Another thing I believe in is fishing with barbed hooks. There are NO scientific studies that show that the use of barbless hooks lower mortality rates on caught trout. The idea of fishing with barbless hooks is a mantra for some, and I am sure many will say I am a heretic, but I’ve outfitted and fished for more than 40 years in southwest Montana, and I am certain that more trout survive when caught and released on barbed flies than trout that are coddled, nursed, cajoled, and worn out by an overly cautious fly fishing angler worried about his barbless hook. Montana Fish, Wildlife, and Parks did an extensive hooking mortality study years ago, and the key to the survival of released trout is speed of landing and release. 1. Get an optimistically sized landing net with soft, clear, rubber mesh. This will give you a big edge on getting a much larger fish to hand. It will also keep the fish safest once you land it and begin fumbling for your camera. 2. Pull harder on the fish you catch in your own area, and begin to really practice applying pressure. 3. Catching big trout is easiest once you have already caught other big fish. Going with your trout tackle to somewhere close where you could really tangle with some carp for example, would help you with the different mindset and techniques of harder running bigger fish. 4. If you fight the fish better, you will both land more of them and your fish will not be as tired. First thing I would say is use a rod that matched for the size of fish you expect to catch. Most intermediate fisherman take a long time to land fish because they don’t push the fish enough to really break their spirit, which is really the key to getting a fish in before it’s totally exhausted. You need to work different anglesâ? ?pull with the rod horizontal to the water rather than straight up in the classic fish fishing pose, and make the fish work against the current. Also just flat pull on the fish. If he ain’t pulling on you, you should be pulling on him. Have the drag set as tight as you can get away with for the tippet size you’re using, and use the heaviest tippet you can get away with for the water clarity, fishing pressure, and technique. 1. Remember that fish don’t breath out of water. If you are in a boat, wet your hands before handling so you don’t compromise their protective slime. 2. Hold the net in the water boatside to remove the hook rather than having the fish flop around in the net bag while the net is in the boat. 3. Hold him up for a picture for the minimum amount of time and then get the fish back in the net for a drink before taking another picture. 4. Try to do everything possible to keep the fish from ending up doing a header and flopping around in the bottom of the boat or on streamside rocks. The most important thing for all fish, regardless of size, is to realize that they are fragile living things that just experienced an aerobic traumatic experience, and you should treat them with respect and be conscientious. 1. Face the fish upstream in gentle flow, preferably in the seam water near shore, not in fast current. 2. Make sure the fish is in an upright position. 3. Don’t let fish go until it gives strong tail-swimming movements and swims firmly out of your gentle grip. In summer heat and warmer temps, this process might take a little longer, but since the fish gave you pleasure, you at least owe the fish the sporting dignity of its life! 1. Use the largest tippet size you can get away with. 3. Fight them hard and fast. 1. Keep the fish in the water. 2. Take your time reviving it. 3. Do not move the fish vigorously forwards and back (oxygen going backward through the gills is not so good). 4. Bleeding does not mean dead. 5. Photos should be prepped so the fish is not out of water for long. 6. Learn how to hold a big fish. Dropping is a no-no!